. . .Of the two, however, the stewardess, as a woman, was the more likely to lend a ready ear to Launce's entreaties in his present emergency. After a faint show of resistance, she consented, not only to leave the room, but to keep her husband out of it, on the understanding that it was not to be occupied for more than ten minutes. Launce made the signal to Natalie at one door, while the stewardess went out by the other. In a moment more the lovers were united in a private room. Is it necessary to say in what language the proceedings were opened? Surely not! There is an inarticulate language of the lips in use on these occasions in which we are all proficient, though we sometimes forget it in later life. Natalie seated herself on a locker. The tea, sugar, and spices were at her back, a side of bacon swung over her head, and a net full of lemons dangled before her face. It might not be roomy, but it was snug and comfortable. MISS OR MRS? (1871). 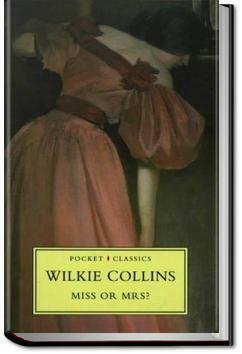 Wilkie Collins. ***. Wilkie, himself, described these stories as "outlines". They were not as compelling as his "full" novels and, since they were not meant to give great detail, sometimes felt "rushed" in regards to "loose ends".